In February, MBPC saw some important wins as bad tax bills that started making it through the legislative session died and some good legislation moved forward. Unfortunately, some bills that would disrupt state revenue and implement bad tax policy emerged as well. Senate tax committee made the right choice and tabled House Bill 148. This bill would have required a supermajority of the legislature to pass any tax or fee increases and would make it even harder for policymakers to enact a responsible and adequate budget. House Bill 269 was defeated on the House floor. HB 269 proposed a constitutional amendment that would limit the types of taxes Montana could levy to two of the following: income tax, property tax, and a general statewide sales tax. If passed, it would result in severe consequences for the state budget, public services, and the state’s credit rating. MBPC and many of our allies cheered when Senate Bill 152 passed the House. SB 152 removes the sunset on the 6-mill university levy which provides university funding. Seventy years of overwhelming support by the voters is enough to know that the 6-mill levy, which provides much-needed funding for our state universities and colleges, should be permanent. MBPC supports strong investments like this in our public education system for higher education. Senate tax committee made the right choice to pass Senate Bill 18, which would establish workforce housing tax credits and help with affordable housing projects in the state. Senate Bill 237 would have created an income tax credit for qualifying health insurance premiums paid. This bill has an estimated loss in state revenue of $45 million each year. While addressing volatility in the health marketplace and resulting increased premiums are issues the legislature could consider, SB 237 would reduce state revenue and would largely benefit high-income taxpayers. Acknowledging the cost of this bill and additional pending legislation, which would be a more direct and cost-effective approach to affordable health care, the Senate Tax Committee tabled this bill. Senate Bill 208 would have created an income tax credit for student loan payment expenditures, resulting in a loss in state revenue of about $23 million a year. The bill does not target that support based on income and would likely benefit higher income earners more. Senate Tax Committee also tabled this proposal. A few new tax bills have emerged that MBPC is keeping an eye on. Senate Bill 239, which was heard in Senate tax committee, provides a temporary property tax exemption for new fiber optic facilities. Local property tax is a zero-sum game, meaning that a taxpayer’s gain in taxes due is balanced by the losses experienced by other taxpayers. Cutting taxes for fiber optic facilities will result in other taxpayers paying more property taxes. In the last two decades, the share of property taxes falling on the backs of individual homeowners has risen – from 30 percent in 1994 to over 48 percent today. SB 239 would shift even more property taxes onto Montana homeowners. House Bill 507 would expand the property qualifying for the data center tax rate of 0.9 percent. Like SB 239, the lack of property taxes paid by these companies will have to be made up by other taxpayers, like residential property taxpayers. Some of the tax bills MBPC is tracking are not only bad policy, but are very expensive for the state. Senate Bill 217 increases the amounts used in the federal calculations for taxable social security benefit, resulting in a loss of state revenue of approximately $20 million each year. Montana already exempts some social security income from taxation, targeted at lower income levels. Unfortunately, this costly bill may be headed to the House. Lastly, MPBC opposes House Bill 401, which will have a hearing on March 13 in House Tax Committee. This bill would repeal the property tax exemption for tribal trust lands while the federal government reviews the application. Land collectively owned by the tribe, as well as land allotted to individual tribal members, is called trust land. Trust land cannot be taxed, as tribes are their own governments and trust land is not under the jurisdiction of the state or the federal government. This bill undermines tribal sovereignty and self-determination of the tribes. In addition, the fiscal note for this bill estimates only $125,000 in additional revenue to state government for FY 2020 through 2023. MBPC urges the legislature to continue to make the right choices for Montana and good tax policy as the 90-day session moves forward. 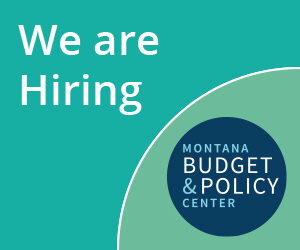 MBPC will be right there with them, advocating for responsible tax, budget, and economic policies that promote opportunity and fairness for all Montanans. As the legislative staff are currently projecting state revenues to come in $34.7 million below projections, we are going to need some revenue. MBPC will be posting updates to the revenue options proposed in the coming weeks.